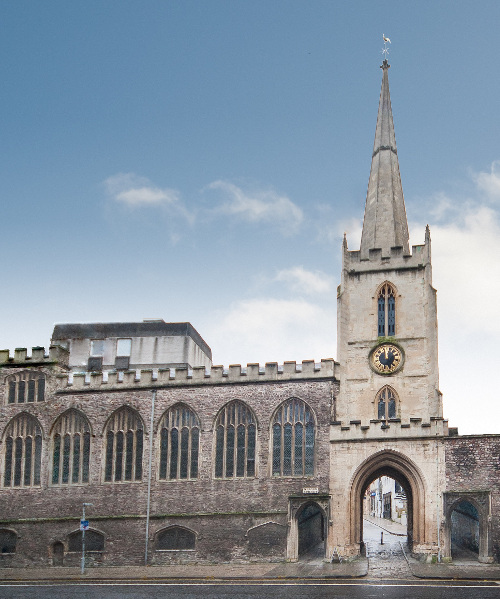 To coincide with its temporary unveiling, after the demolition of a neighbouring eight storey office building, the Churches Conservation Trust is inviting Bristol residents to share memories of this landmark church. Listed Grade 1, the church of St John the Baptist on Quay Street was built over west entrance to the City (one of four, on the cardinal points), for travellers to offer prayers before a journey. Constructed in the 14th century, it is the only remaining intact building in Bristol that was built into the original city walls, though the two side arches were formed in the 1820s. Also at this time, the interior of the church was significantly modified. The St John’s Conduit, which terminates nearby, was originally built for the friary of the Carmelites but also supplied the people of Brandon Hill, though the parishioners were allowed to use only the overflow from the system. After the Blitzing of Bristol Blitz in 1941-2, the conduit was the only available water supply for central Bristol, when the water mains supply had been damaged. Past users of the church or the conduit, or people that know of an ancestral connection to the building, are invited to share them with the Churches Conservation Trust. Stories and memories will be recorded on audio tape before being transcribed, and later displayed in the church, as part of national Heritage Open Days in September and added to Bristol’s archives. To record a memory, visitors can visit the church between 11am–2pm daily and speak to a steward, or can contact the charity on 0117 929 1766 or ku.gro.tccehtnull@lotsirB. For more information about the CCT, visit www.visitchurches.org.uk.